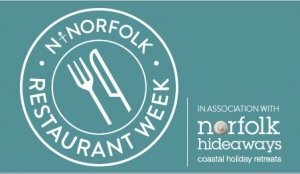 Restaurant Week is North Norfolk’s Largent dining event celebrating the vibrant restaurant scenes of fine food and the people who work hard to produce it. It is a fantastic opportunity for you to sample the 46 participating restaurants (including us!) or having the chance to revisit existing favourites and fantastic prices. This year The Three Horseshoes are offering over our dinner and lunch menu 2 course meal for £10 and 3 course meal for £15. Please click on the link below to view The Three Horseshoes Menu as a PDF. To book your table over the course of this event, please call us on 01485 600666 and quote North Norfolk Restaurant week.